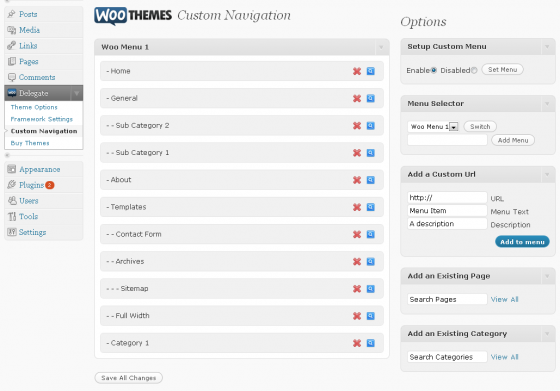 This functionality became part of WordPress itself. You can create custom menus under Appearance>Menus from the WordPress dashboard. One of the most commonly asked questions by Woo users is how to modify the navigation in the theme, by excluding items, adding external links etc. We recently added Jeff to our team, and started him off with a project we had been planning for a while; A new custom navigation admin page, where you would be able to really build your own navigation without touching any code. It didn’t take long for him to come up with the wireframe, and then Cobus added some nice styling to the UI, and we can now proudly present it to you! We’ll start off slow by adding it to our newest themes first, and we hope to get feedback and squish any possible bugs that should appear before rolling it out to all our themes.